Finally! Something to do with all those beautiful photos you’ve been taking and then ignoring on your phone or computer. 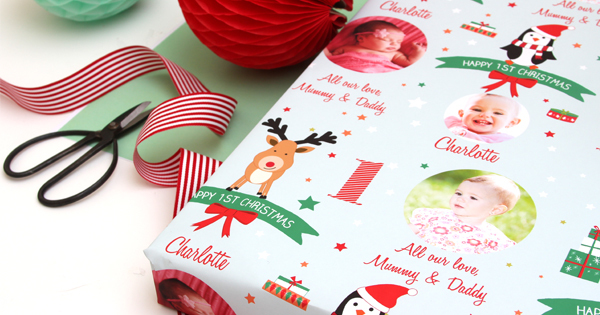 The folks at Love JK have come up with the nifty idea of decorating wrapping paper with your own images and text. An idea that makes your gift extra special, but is easy to organize and looks like way more effort than it actually is? A win for time poor parents! That’s all of us, right? If I whipped out presents wrapped in the smiling faces of my family and friends this Christmas you can be sure a few jaws would drop. Not only because the gift wrap is especially beautiful, but also because everyone would be in shock that I am so super organised as to have personalised wrapping paper. In fact you may even save yourself time by doing away with gift tags – people can enjoy the novelty of checking for their own face on parcels instead! Of course you aren’t limited to only using this paper at Christmas. 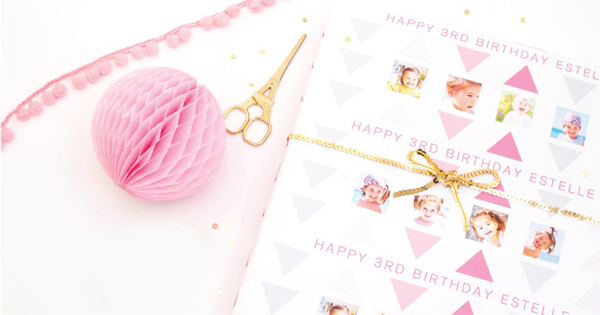 You can create gift wrap for any occasion from baby showers to birthdays. With so many templates to choose from, Love JK have made it easy to create a professional result. Slipping your photos into one of their themed designs and choosing your own text is a very quick and straight forward process. If you can’t bear the thought of giving your beautiful paper away you could always create a lovely pressie for yourself by wrapping a journal or diary for you to appreciate throughout the year. Or wrapping a journal for someone else would make an awesome present too. Paper is available from Love JK from $8.99.